If you follow me you probably know that I had surgery at the beginning of the month. I was not able to sew for a week or two during recovery and what really saved me from being quite depressed about that was watching quilting classes and videos online! I bought a Craftsy class and also watched some of the classes I had purchased previously. When you purchases classes at Craftsy you can watch as many times as you like. You can also ask questions to your instructor and share photos of your projects. One of the things I enjoy about Craftsy classes is that I get the opportunity to learn from well known quilters right in my own home (in my pajamas usually!). I am not in a position right now to travel to quilting conventions and retreats so this way I can still learn new techniques without the expense of travelling to take a class. Here is my Inset Circle pillow that I made with a new technique I just learned from the latest Craftsy Class I took. Inset circle pillow featuring West Hills Horses by Heather Ross in the centre. I am so pleased with how this turned out! Here is the pillow back. This Cotton + Steel Basic was a perfect match! Craftsy offered me a free class to review so I chose one I had in my wishlist: "Inset & Applique Circles by Machine" taught by Cheryl Arikison. 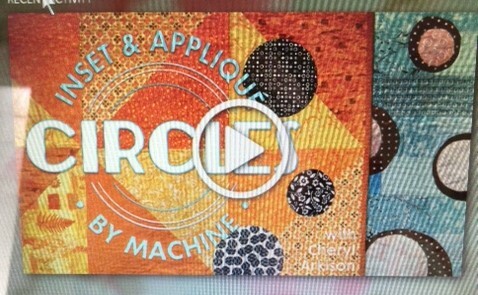 Craftsy is offering "Inset & Applique Circles by Machine" with Cheryl Arkison to my readers for 50% off using this link. The original price was $39.99 but you can get this class for $19.99 until March 30th, 2015 at 11:59 pm MT. Cheryl thoroughly goes over several different techniques for adding circles to your quilts and I learned quite a few new things in this class. I have been quilting for almost 20 years and I am still learning new things all the time. I really appreciated Cheryl's clear voice and matter of fact instructions. She is comfortable being herself in the videos and her instructions made complete sense to me. She also shares tips for being frugal and economical in quilting down to the last usable scrap. This course does not require expensive extra equipment. If you have a roll of freezer paper and a compass you are ready to begin. The inset circle was the technique I wanted to try first and I made my inset circle pillow in about an hour and a half. I am so, so pleased with the results! I confidently recommend this class to you without hesitation.